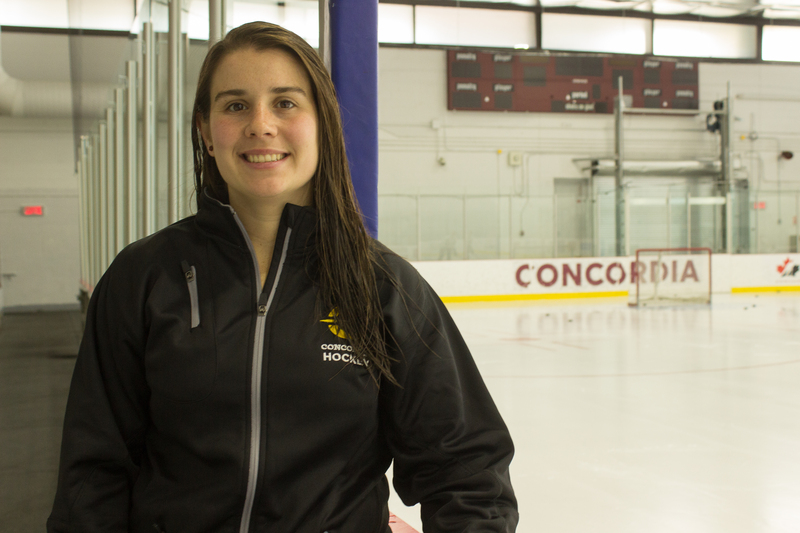 Despite her small stature, Concordia Stingers women’s hockey captain Tracy-Ann Lavigne has a big personality. The five-foot-three centre is completing her fifth and final year with the team, and beginning her first year as captain. Lavigne has a never-back-down attitude. On the ice, she’s a grinder and not afraid to get physical with her opponents in the corners. Likewise, she doesn’t back away from a challenge off the ice, whether it be in the gym or the classroom. Lavigne was one of two co-captains last season, and this season her teammates voted for her to become full-time captain. Some players change when handed a leadership role, as the task of commanding a group can skew their personality. Lavigne, however, has no intention of changing her style now that she’s captain. As the captain of a team, Lavigne’s attitude and emotions rub off on her teammates, so she said she tries to stay as positive as possible. For student-athletes, a positive attitude is not always easy to maintain. Between studying and playing hockey, Lavigne said her teammates often get overwhelmed and need a boost at times. Lavigne is the first to console a teammate and try to put a smile on their face. On the ice, she is the one to tap a teammate on the knee or offer a fist bump and words of encouragement. When her teammates make mistakes, she reminds them to put it behind them and learn from them. Off the ice, if Lavigne sees a teammate in a funk, she will go talk to them and try to cheer them up. This is Lavigne’s fifth and final season with the Concordia Stingers. Photo by Brianna Thicke. “I sit with them sometimes if it’s really intense. I just talk to them, and I just try to cheer them up,” Lavigne said. Lavigne describes herself as a “goofball” on the ice with her teammates. After learning how to skate at the age of two, Lavigne played boys hockey until she reached the Bantam level at 13-years-old. Girls playing boys hockey before their teenage years is not uncommon, however, Lavigne faced adversity along the way. The Montreal native was much smaller than most of the boys she played against, and she is still unafraid to go up against men now. When asked if she would like to go on the ice with the men’s hockey team, who was practicing during the interview, Lavigne seemed excited about the challenge. “Seriously, I wouldn’t mind going there and trying to go hard against them,” Lavigne said with a smile. Lavigne only played against other girls once she started playing at the higher levels. She played Bantam and Midget AA hockey for the Canadiennes de Montreal before playing at Dawson College for three years. Lavigne said this adversity and the constant need to prove herself is reflected in her style of play. She admits she is tough to play against and isn’t worried about going up against bigger opponents. She is the player on the team who will do the physical work so her teammates can get the puck in an open space. “I’m the grinder. I’m the one that’s going to go in the corners and won’t be easy to [play against]. I just want to get the puck out when I’m there,” Lavigne said. Lavigne spoke about her rugged style of play with a sense of pride. She added she will not become physical enough to merit a penalty. For such a tough player, her penalty time—56 penalty minutes in 85 games with the Stingers before this season—is surprisingly low. By the end of this season, Lavigne will have played over 100 games wearing the Stingers maroon and gold. Over her career, she has had many great memories, but the one that sticks with her the most is friendship. Sports editor Nicholas Di Giovanni is a third-year Journalism student at Concordia, and has been with The Concordian since 2016-17. He's passionate about covering all of the Concordia Stingers teams.